The Metropolitan Opera’s Peabody and Emmy Award-winning series The Met: Live in HD continues for its thirteenth season in 2018-19, featuring 10 live transmissions from New York. Don’t miss the chance to experience the Met LIVE at the Strand! 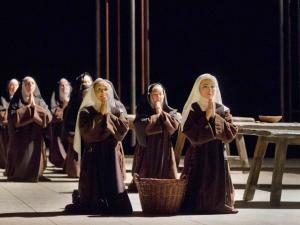 Visit the Met Opera Live-In-HD Website for additional information. LIVE Performance: $27/Adult, $15/Student (Plus $2.50 service charge for Phone or Online ticket purchases) -- Available on this website; or by calling (207) 594-0070 Monday - Friday, noon - 4pm); or in person at the box office 90 minutes prior to showtime or when the theater is open for movies or other events (including every night from 6:30 - 8:30 pm; please check our schedule for additional times). All seats for the Met Opera LIVE Performances are reserved seating. ENCORE Peformance: $23/Adult, $5/Student -- Sold Day of Show only, at the box office 90 minutes prior to showtime. No reserved seating for ENCORE peformances.